This is a very belated post, but late is always better than never. 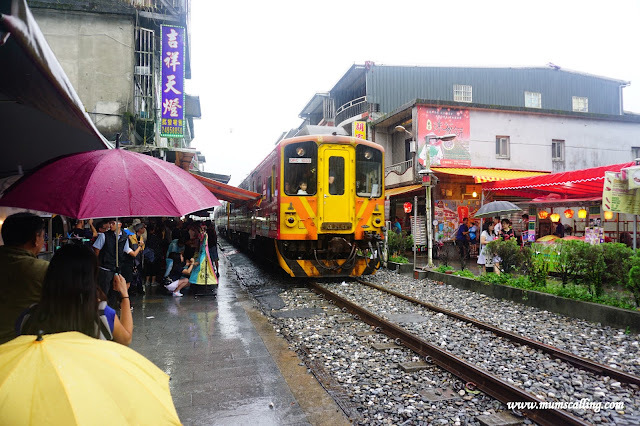 I thought we should document our Taiwan trip somewhere for the sake of memory refresher or search back. 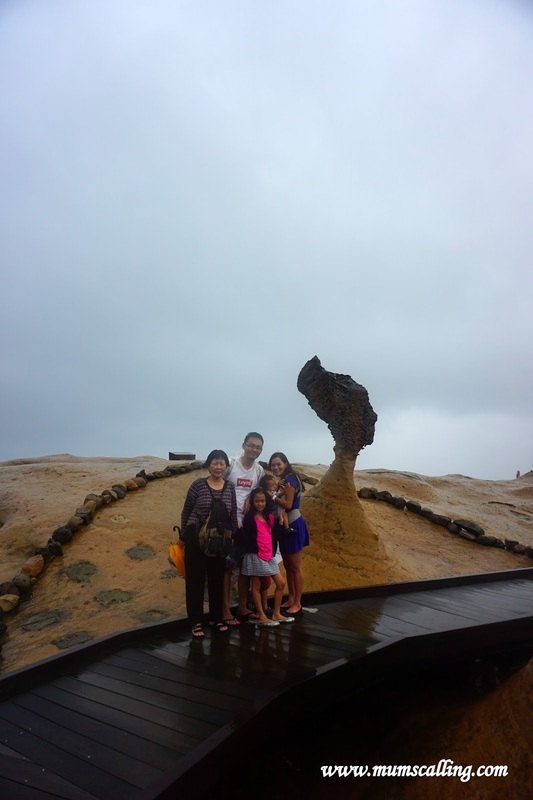 We did an 8D/7N Taiwan trip during the last June holiday, with the 3 little ones and my Mum. We had a very well paced and non-rushing itinerary. Love it this way. Welcomed by the very rainy season in Taipei. 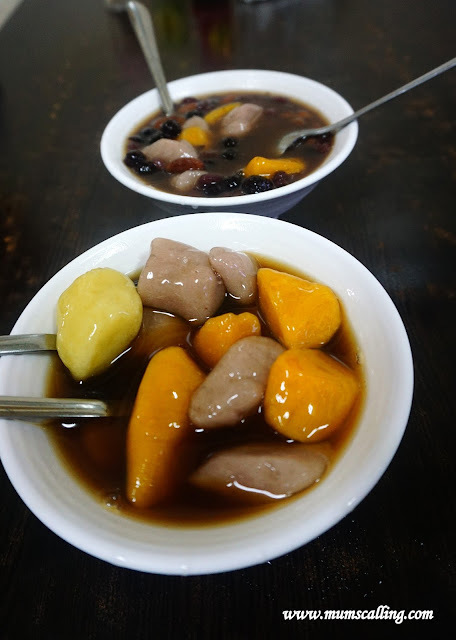 We hired a driver for one full day of chauffeur to Yehliu, Shifen and Jiufen. We visited Yehliu Geopark (野柳地質公園), which is home to some of the most famous eroded rock formations in the world. If you love nature, this will be one place you should step foot on. My man is an extreme nature lover, and I'm glad the kids did enjoy this part of the tour too. It will be better enjoyed if it wasn't raining on us. The eroded rocks tickles much on imagination, leaving you to wonder what they each look like. While some are famously identified like the queen's head, some provokes you to imagine further. Keep the kids busy by asking them to imagine and imagine. During peak sunny period, a long line may form to taking picture with the queen's head rock. Wet days seem good, it wasn't overly long when we visited. Only bad was that ours pictures didn't turn out well due to the weather, which no amount of editing can salvage. To enter the park, a nominal entrance fee is required. Children below 6 enters free. 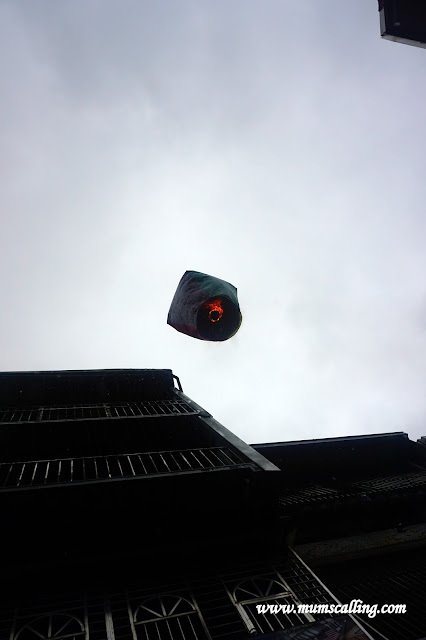 After Yehliu, our driver drove us to Shifen （十份）for the excitement of releasing sky lantern. We thought this must be a visit with kids! 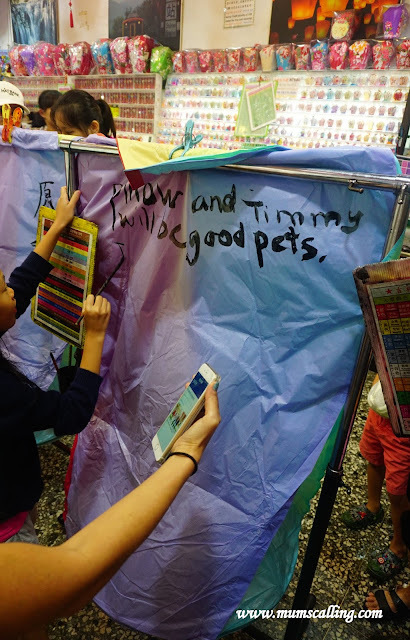 It was fun writing wishes on lanterns made of rice paper, and then releasing it into the sky. Whether wishes come to past or not, it's nice to know there's always hope. My idea was to try get them write something in Chinese, which we eventually ended up writing in English! Then it was also an opportunity to explain to the kids the concept of hot air balloon. Fire generates the hot air, which is lighter than the surrounding cold air, and it rises the lantern. Prices of the sky lanterns are mostly the same even as you walk inwards. 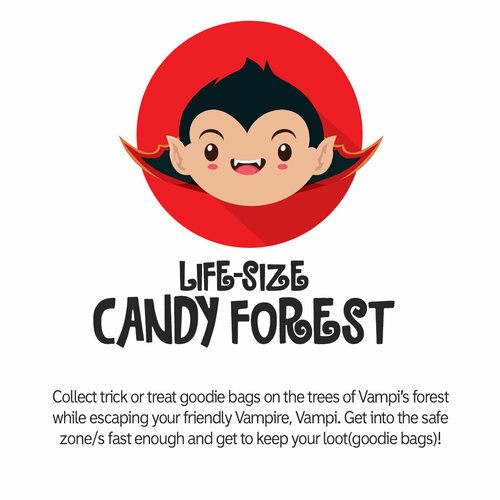 So save some time, skip the bargain hunt. It was very much crowded the weekend we visited and due to the rain, we didn't manage to release and take picture with the lantern along the railway track. The track is a great spot for photo taking, but beware! Tracks are in use, watch out for little kids and hop off the tracks when you hear the chugging and horn of the train. After sky lantern, it was most convenient to move over to Jiufen (九份） for some local delights. We shopped mainly food. I've to say dessert was a very satisfying hunt within. 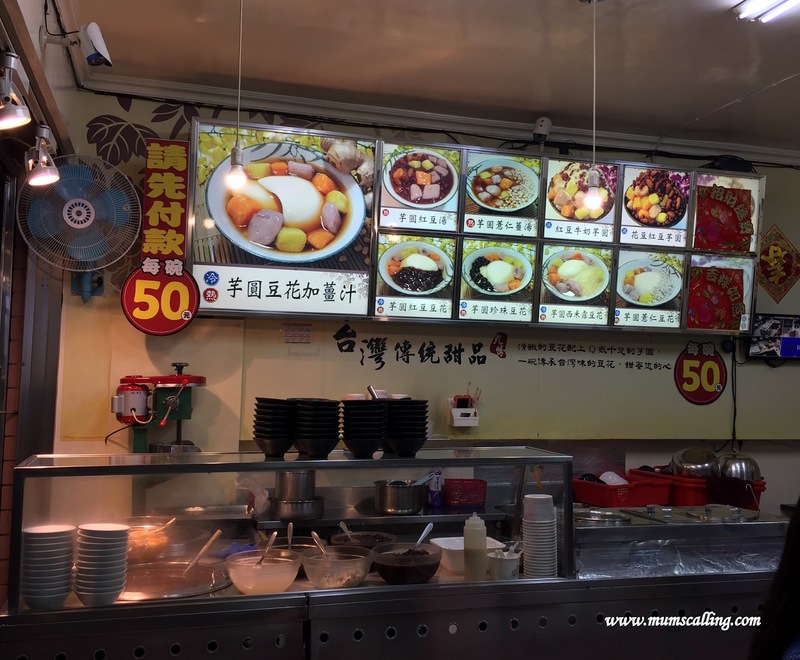 Love this stall that we chanced upon, where we had yam and sweet potato with beancurd. It was good! Their hot ginger soup was soooo good too! Maybe rainy weather played a part. As we navigated along, the street got more challenging with steep steps and slopes. Hold on well to little kids and elderly. There's also public toilet within, which we had to ask for directions. We covered 3 locations within this day. It was quite well paced and not at all rushed. 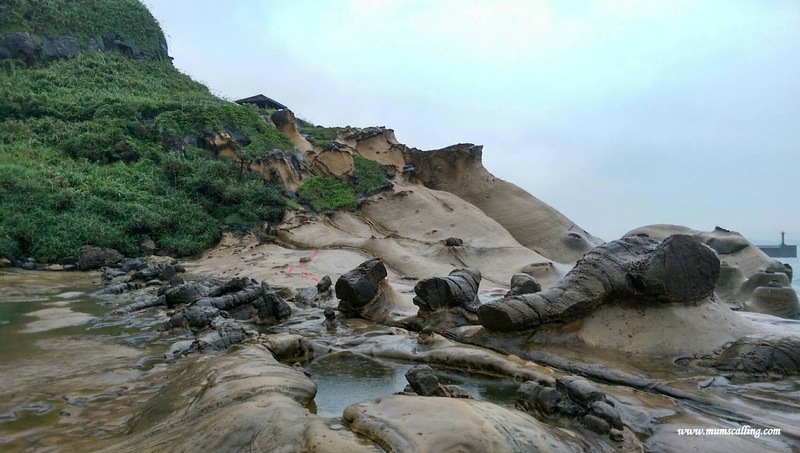 More time will need to be catered to Yehliu though, there's much walking and sightseeing that may slow you down. We stayed in an apartment instead of a hotel. We booked itaipei Service Apartment, which was just above Taipei main station. I won't highly recommend it though. We hard a tough time locating it and the bathroom was just to tiny for us. Next coming up post, Day 3 was much dedicated to the kids! 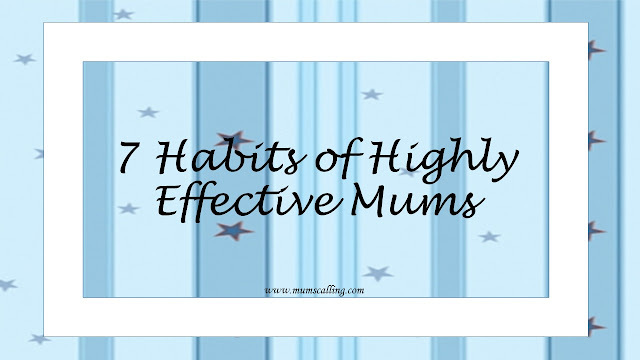 Having read the 7 habits of highly effective people, I think we should have the 7 habits of highly effective Mums too. Here are the 7 essence of an effective Mum I accumulated over months of thoughts. Getting too little sleep makes us groggy and too much sleep makes us equally weak (getting up later isn't much of an option for most Mums anyway). I know, it's just tough to get that hours of sleep for some of us. The quiet hours that we can trade for while kids are asleep are just so precious. But sleeping is important to help clear away a day of junk so that we can function our Motherly role for a better tomorrow. Effective Mums know nagging has no impact on kids. Instead, a firm reminder gets their tasks all on track. 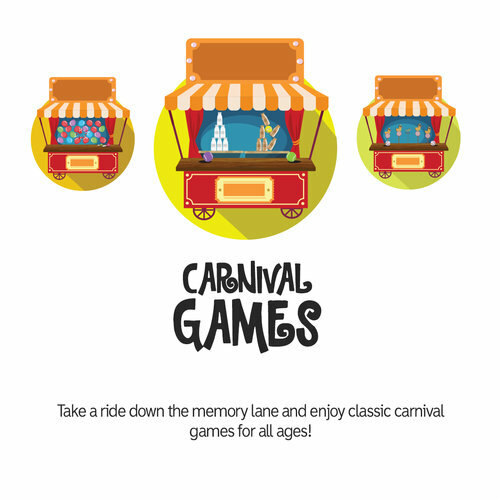 Remind and give them a time to complete the task. Instead of "You never clear your plate again" try "You didn't clear your plate." Using the right tone and words help us avoid being a nag. It often helps when I say "finish your writing by 3 o'clock", and then check back at that time. I only need to remind once. It works better than repeatedly saying "Go and finish your writing" where it becomes a live example of words fallen on deaf ears and incidentally training them to ignore our words. Try this too, hold them by their hand, look into their eyes and verbalise the task. It is effective 8 out of 10 times for me. If we manage our expectations reasonably, we reduce much frustrating moments. Most times we fail to communicate simply because our brains are wired differently, our priorities and interests are different. 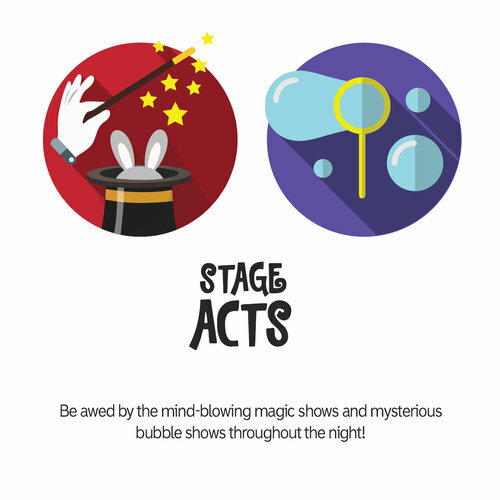 Fun, toys and TV may get on their 'NOW' list, while essential task completion is on our 'FOCUS' list, which is their 'LATER'. I know, it's tricky to handle. We find opportunities to balance this so that we don't look just like parents of taker, but giver at times too. We often expect maturity when their brains have yet to fully mature at their developmental stages. Understanding that kids are not little adults grant us extra patience when communicating. In the millennial parenting of today, this is one easy to say, hard to practice phrase. Helicopter parenting is ubiquitous. We do almost anything for our child when most times, they are capable of handling the task themselves. Since Js' preschool days, I did every bag packing for them until it was their first kindergarten year where they took over that duty of packing their own bags. I did my part of showing them what and how to pack, and left them to do so from then on. From every incident of forgetting to bring towel, undergarment or new set of clothes, they learn a very important lesson. Which is responsibility! They are their bag owners, not me. Some mistakes and failures may be irreversible or have dire consequences. We should then make use of simple and teachable moments to help them experience. Jazz is very much responsible for her school work now, she marks her own spelling, 听写 and test dates without much reminders. And once, she forgot to study for her 听写, which I could tell instantly from the grade that was unusually low. I didn't have to speak and she related she forgot to study for it. I'm comforted that she took responsibility over it. She was upset with her grade, but that became my opportunity to talk about handling 'failure.' It's moments like these that we see them grow. Mistakes and failures are safe when there is love. Realised that the more consistent we are, the lesser kids test our rules and boundaries? I honestly have not perfected this skill of consistency. Simply because I often overestimate and give consequences that I didn't enforce. Just like when they misbehave after a warning, I tell them we won't go to the movies (I've already bought tickets), but didn't see through it. Forgoing the movie tickets is not doing any justice to my money! I should have given a consequence that I can enforce. Consistency and routine is a good guide for kids to know what they should be expecting. There is often a fine line between pride and self confidence. Pride demands a voice, but self confidence is quiet. With humility, we become open to take on advice. Though what works in other families may not work for ours, being open and honest help us confront pride, search for ideas and solutions that may fit our missing puzzle. Other parenting blogs and books give me the inspiration and comfort to know that I am not going through the battle of sanity alone. When we put on humility, we teach, and our kids learn. Having spoken to teachers of pre-schools and primary schools, I find it very much common when Mums often only see how their child was wronged in a situation much more than seeing him as wrong as the other child in a situation. The ability to guide and teach a child is then masked out by Mum's Pride! Pride often puts us in comparison and draws distance from others. Choose wisely. We make our everyday easier by embracing imperfections. It doesn't mean that we accept meritocracy or not give a 100% effort. We celebrate best effort! We knew we didn't begin with a perfect child and perfect Mum, only unique child and Mum who make mistakes along the way. My son often tips over his cup of milk. So do I, as an adult. Albeit lesser times than him. Social media photos are not picture perfect. Reality is not picture perfect. Shortfall of goals and milestones are keeping ourselves real! It's okay. 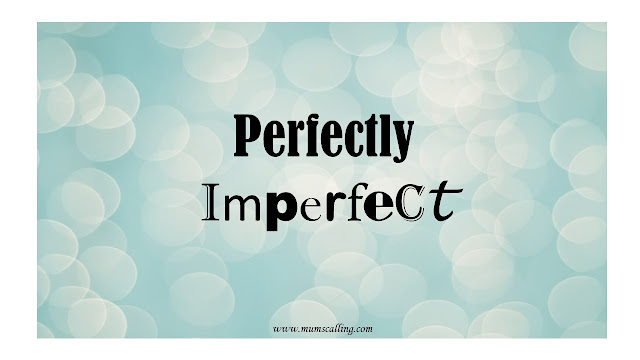 Motherhood is guilt free when we embrace imperfections. Not that I have mastered all 7 points at the tip of my mind. I struggle some days too. There are certainly more points out there to mark it beyond 7. At least, these are essential enough to see us through day to day without pulling our hair out. 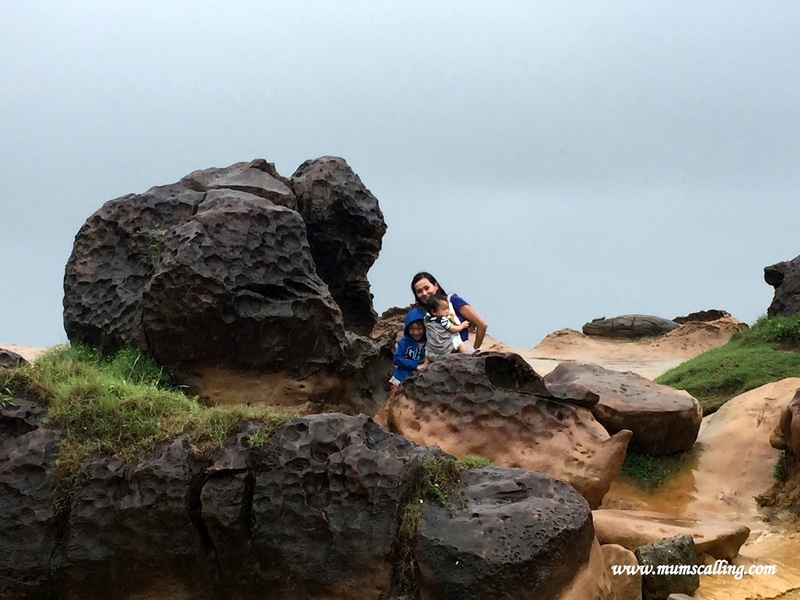 Motherhood effectiveness is not multitasking like speaking to our child with eyes on our phone. It's not playing a board game with much distraction by our phone. It is simply coming to a balanced level understanding between our children and us! What are your methods of parenting effectiveness? Join the biggest family friendly Halloween event this October and November 2017 at KidZania Singapore!! It will be a night out filled with loads of activities that are children safe, entertaining, fun and full of free candies! 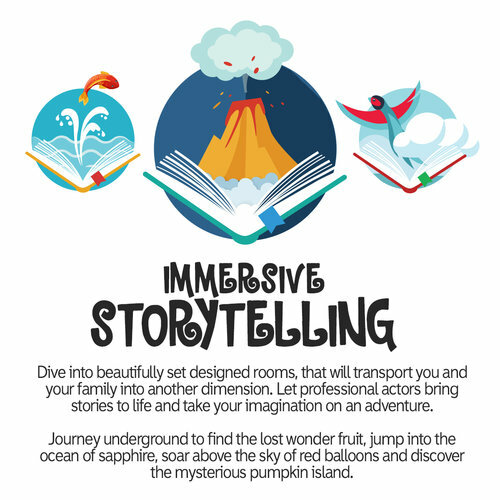 Take part in Interactive game, Vampi the Vampire's Candy Forest Hunt, go Under the Sea or Into The Volcano for immersive storytelling experiences, knock on spooky doors to Trick or Treat and Search for the buried treasures of Magic Mummy. 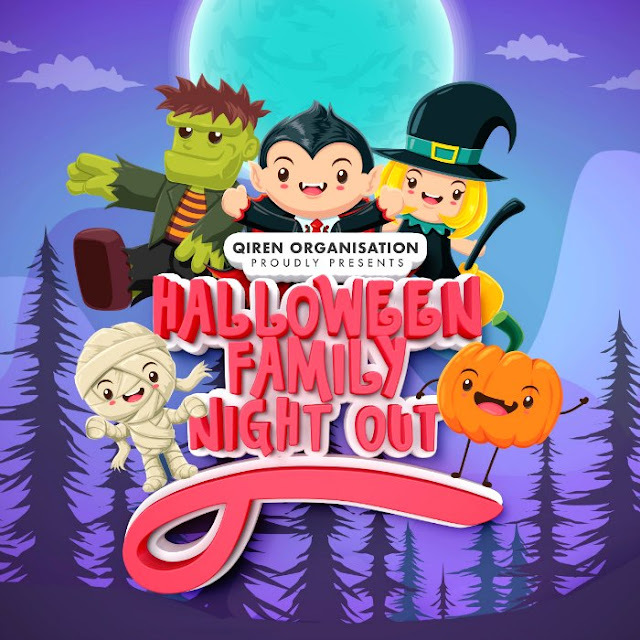 There are also carnival games (additional cost), spooky snack-bites (addtional cost), 4 magic shows and mysterious bubble shows throughout the night, and not forgetting attractive prizes that await the top 3 families in the best dressed costumes! Tip: Costume rental ideas can be found at My Mini-Me. 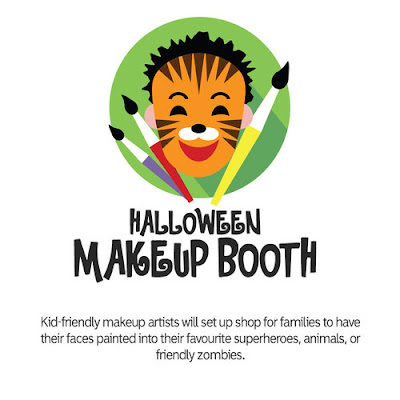 Quote 'MUM'S CALLING' upon order for a $5 discount per costume. We know, it is looking very much immense with fun! Get your tickets here. 28 Oct is already sold out, so hurry! Each purchased ticket is entitled to a GOODIE BAG which includes a limited edition trick or treat popcorn bucket, a halloweenFNO Cape and the secret treasure map of magic mummy! Children below 2 enter free, but not entitled to goodie bag. 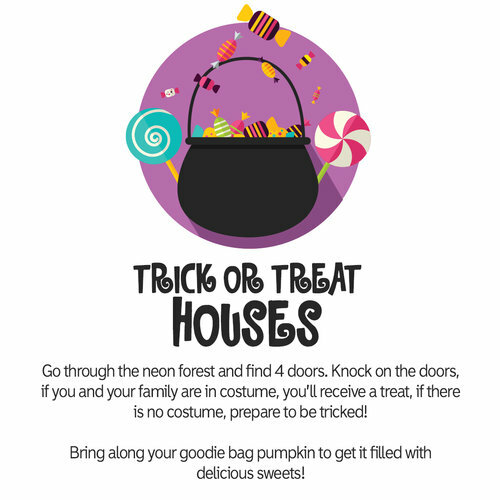 Looking forward to the Friendly Halloween FUN! Since junior days, freckles and pigmentation have found their places on my face. I was a rather outdoor person and had never really bother too much about skin care. It could also be my genetic misfortune that I became an easy victim for pigmentation. Sunscreen was never in my routine until I discovered vanity, which was probably in my early twenties. By then, pigmentation has invaded quite a bit and it became so annoying especially after embracing Motherhood. Having gone through 3 pregnancies and riding on hormonal changes, I greeted even more pigmentation. Youth is gone and beauty is passing. No more waiting game, I was determined to rid them. 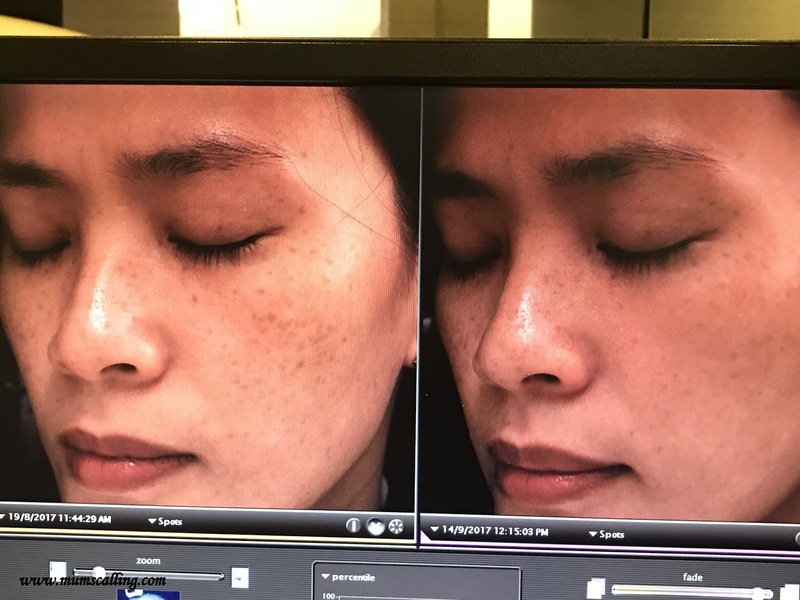 I embarked on a couple of laser toning sessions with Dr Chan at Dr Calvin Chan Aesthetic and Laser Clinic to lighten them. Laser was my first choice of treatment for it being quick and effective. It does take a couple of sessions to clear them almost completely, even though it was significantly lightened after the first session. 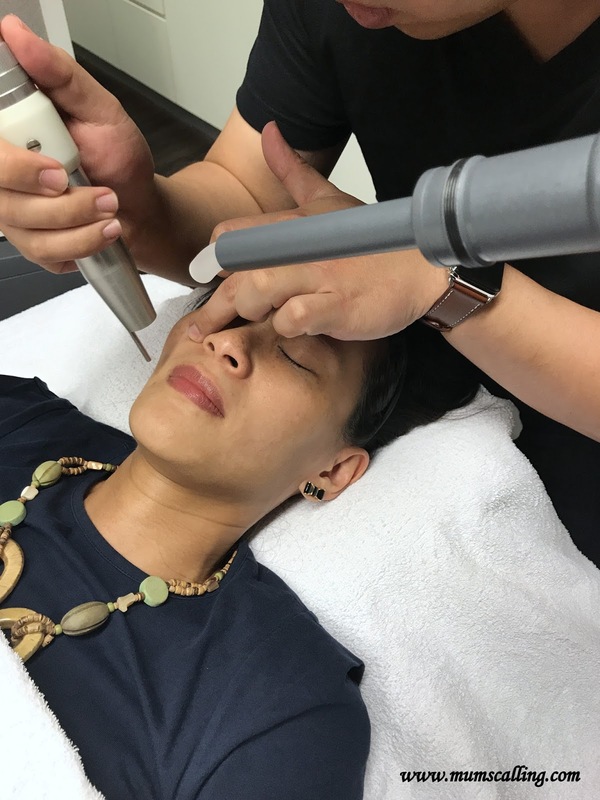 Laser-ing may not be a permanent solution and it can make a come back if you do not stay rigorous in your skin protection regime, especially during and after pregnancy. That's a big part of reason on why I chose to act upon it only after I'm done with childbirths. My first session was IPL (Intense Pulsed Light), followed by Medlite (Q-switched Nd:YAG laser) 4 weeks later. Dr Chan recommended 10 sessions of treatment to lighten my pigmentation. Though I'm no where near the 10th, I must testify that I am already very much impressed and satisfied with the results this far. IPL may be more for diffused spots while Medlite seems more for targeted spots. I must have given him a hard time with my very diffused spots. Having said that, different faces require a tailored treatment plan. You do need to swing into his clinic for a Free consultation on the best treatment plan. Before every session, a photo of your front and side profiles will be taken for results comparison. It is a good track of the treatment progression. IPL is done by Dr Chan's clinic assistant and Medlite is done by Dr Chan personally. Medlite is an FDA approved procedure for skin rejuvenation that does not thin your skin. It offers a no-downtime option to treat problems like active breakouts, acne scarring, oily skin, large pores, fine wrinkles and pigmentation. I love the many overlapping problems it covers for my face. Medlite works by delivering thermal energy into the skin and breaks down the pigments into mini-pigments, which is absorbed by the skin, and then destroyed by the body’s lymphatic system. In short it is one clinically safe procedure to go through with no side effects. The procedure is rather swift, about 15 minutes. The laser energy feels like many tiny hot dots on your skin, similar to the discomfort of rubberband snaps at each spot. It is however very tolerable. I opted to do it without numbing cream just so I can relate my experience here. Heh. Alright, I teared a little. Numbing cream can be opted for a charge of $20 and applied 30 minutes before the procedure. If not, it really is tolerable. The pain is reduced by a stream of cold air directed at the spots during the procedure. After the Medlite procedure, my face felt burning and there was some red flush on my face, seemingly like mossie bites. It went off within an hour. Subsequently, the spots darken to become crust-like scabs, and the best part was witnessing these scabs fall off within the next 3 to 5 days. Pigments get lighter! It is therefore wiser to schedule a major date or function 5 days after your treatment. Where your face glows and probably presents its best. If you have very diffused pigmentation like mine, the initial days after treatment may not look appealing with darkened scabs sitting significantly. It is most crucial that you continue your skin protection routine faithfully and stay away from the sun. Gear up with hats, umbrella and sunscreen wherever you go. I know, it's tough to avoid the outdoor when you have kids. I do school runs with hats, shades and even a cardigan to protect my arms. It's crazy how pigments get onto my arms too! I am loving my skin and embracing my identity with more confidence. Motherhood is never an end to looking good. And the best part about walking into an aesthetic clinics is that they do not hard sell like beauty salons, you are at ease of having full trust in the hands of a professional doctor. No frills. 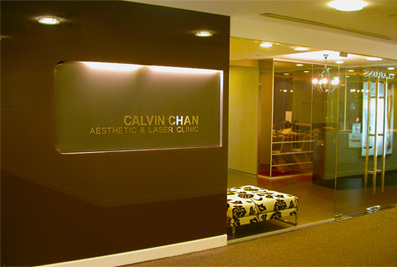 Dr Chan has been in the practice of aesthetic medicine since 2002. That's a whopping 15 years of experience! I say experience counts when it comes to the essence of face! Dr Chan has no consultation charges. Mark your appointment soon!